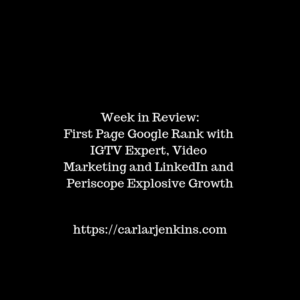 If you have read my midweek review, you would have known that I have ranked first page Google rank for ‘IGTV Expert’. I am still on cloud nine about getting first page Google Rank! First page google is big because 95% people don’t go past the first page. That means that when people are searching for Instagram TV (IGTV) Expert, I come up! And, let’s not forget that Google is the #1 website in the WORLD! I have received 2100 LinkedIn followers this past Monday and by Friday, I have received 2118 followers. It usually takes me 2 weeks to get 25 followers. I attribute this growth towards my I Earned My ITIL in 1 Week and It’s March Already! How Well Are You Doing 60 Days In? I am getting a lot of positive results and shares from recording my second work video series. I am still getting retweets and shares from Twitter, Facebook, LinkedIn and Instagram. I need to get the word out to people that I am back in my hometown Cleveland. I have passed the 350,000 Periscope hearts this past Monday. On Friday, I have reached 369,000 hearts. A nearly 20,000 more hearts have come from broadcasting more and focusing on my job search. I have received a LinkedIn connection request from someone sharing my broadcast to one. In addition, I have finally discovered how to apply real-world examples for project management. I usually don’t add an app to my top 5 list but I must add www.loola.tv to it. I use it for streaming Instagram Live from my desktop because the app would not cooperate with my new cell phone. I am very happy to announce that Loola.tv has Periscope. This means that I can now broadcast on YouTube Live, Instagram Live and Periscope.